The text is a nice hardcover book, and the notebooking journals are spiral bound, so the pages lay flat as you work on them. The coloring book is a typical softcover coloring book with pictures for your very youngest students. All are very nice quality, as I've come to expect from Apologia. The course is broken out into 16 weeks of 3 lessons, or 48 days, so about half a school year if you use it 3 days per week. My girls are 13 and 14, and were fine with the length of the lessons. My son, who is 6 and a half, had a hard time with the longer readings. He started out listening, but it worked out best to let him play with Legos or blocks while we read the lessons aloud. Honestly, for something I'd like to use as a morning time activity, the readings are too long. 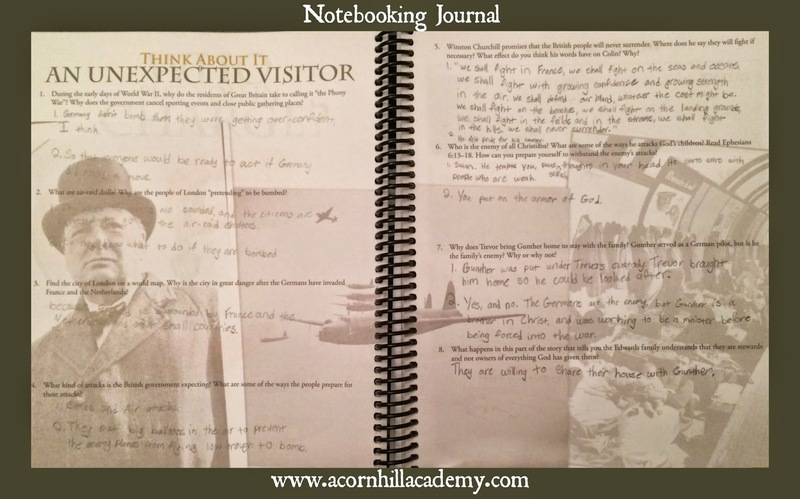 The notebooking journals add a lot to this program. The reading schedule is in the front of both the Junior Notebooking Journal and the regular Notebooking Journal, so you know which pages to read in the text and which notebook pages correspond to the reading. I think it would be a key component for a student reading the text independently. And, although my son was not terribly interested in listening intently to the readings, when he and I worked on the activities in the junior journal, we were able to talk about the lessons, and I could tell that he picked up on more than I thought he would. 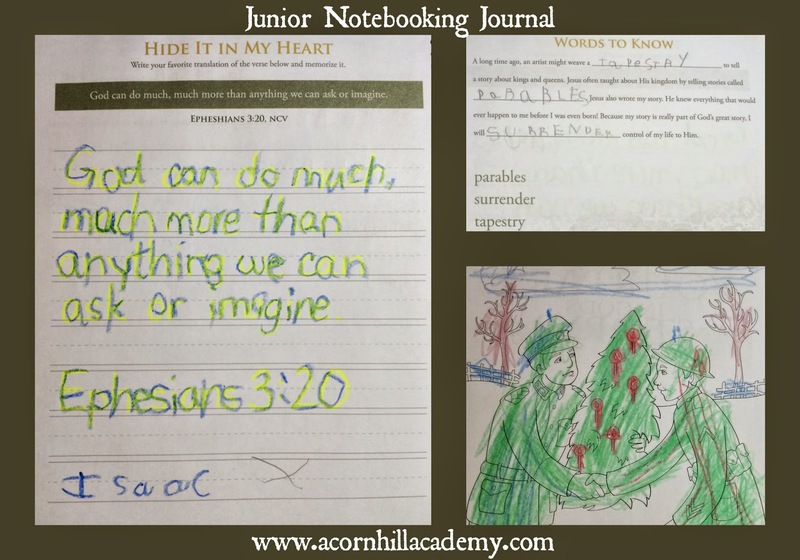 He might not have been quite ready for all the things in the junior journal, but he enjoyed working in it - even when he did his copywork in crayon. He can do word searches with help, too. We had a good time. The parables are rewritten in an engaging style with cultural information that explains a lot about the stories. There are of images of beautiful, historical artwork. All the stories and biographies relate to World War II, and it was interesting to watch that unfold as we went through the lessons. They worked well to illustrate the ideas of time, talents and tithes, or stewardship, which is the goal of the book. Bible verses were presented in versions that best presented the concept in the text. That is a pet peeve of mine. Apologia is certainly not the only publisher to do this, and I've even seen it done in sermons in church, but I don't like it. The lessons are long for younger children to sit through. They were longer than I'd prefer for a family devotional. The readings range from three to fourteen pages, and the pages are large, textbook-sized pages. Three was good; fourteen, not so much. You could certainly read less in one sitting; one of the benefits of homeschooling is having a flexible schedule. 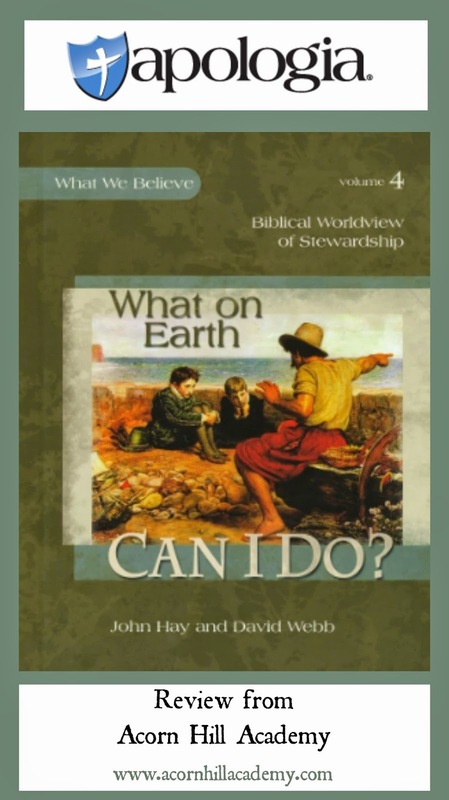 If you are looking for a christian worldview curriculum, this is a good option. It clarified for me that my children are already developing a solid Christian worldview, because we read the Bible together and talk about it. We have great discussions about the way we live our life and the reasons behind it, without using a curriculum. I was concerned that we weren't doing enough in that area, and now I know we are. Connect with Apologia on Facebook, Twitter, Pinterest, and Google+.